Echoes. The Book. The Reviews. | Great Escape. Nick Bullock. Echoes. The Book. The Reviews. 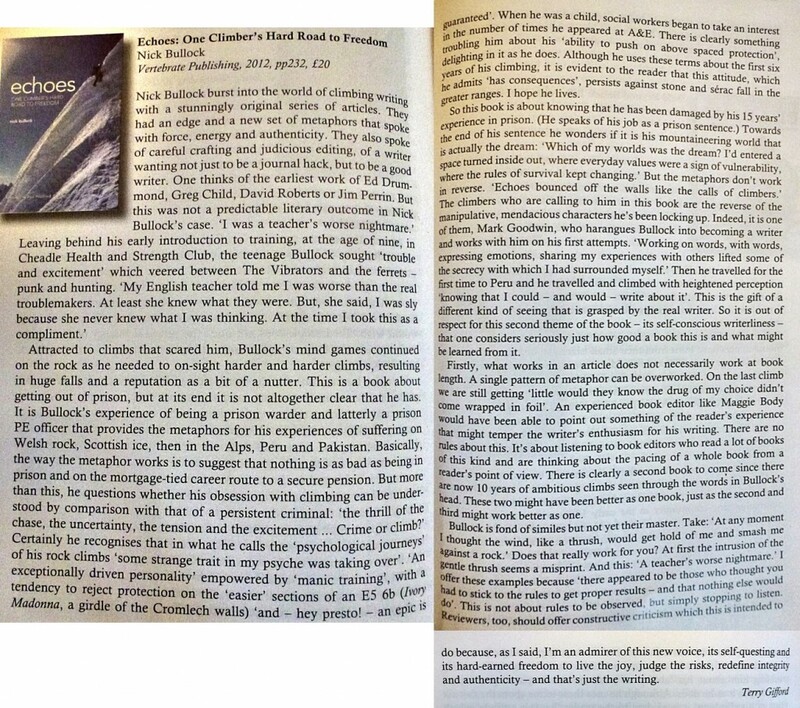 Terry Gifford review of Echoes for the 2013 Alpine Journal. 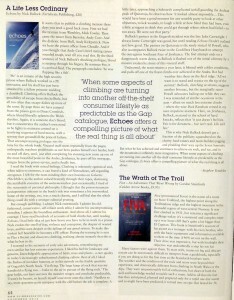 Stephen Venables review for Climb Magazine. 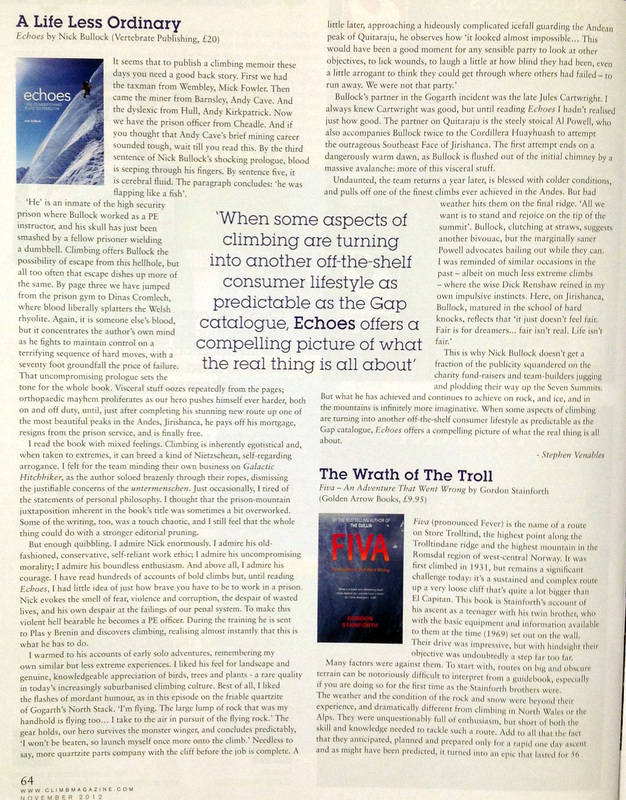 Stephen Venables review of Echoes from Climb Magazine. John Coefield. “A brilliant page turner from one of our most outstanding adventure mountaineers.” – Chris Bonington. “Wild, exciting and inspirational. A book that grips you throughout with wild tales from handling Britain’s most notorious criminals to tackling some of the world’s most exciting unclimbed lines. I loved it.” – Mick Fowler. Echoes is my first published book which is available from Vertebrate Publishing on September the 4th, 2012. Nick Bullock was a prison officer working in a maximum-security jail with some of Britain’s most notorious criminals. Trapped in a world of aggression and fear, he felt frustrated and alone. Then he discovered the mountains. Making up for lost time, Bullock soon became one of Britain’s best climbers, learning his trade in the mountains of Scotland and Wales, and travelling from Pakistan to Peru in his search for new routes and a new way of seeing the world – and ultimately an escape route from his life inside. Told that no one ever leaves the service – the security, the stability, the ‘job for life’ – Bullock focused his existence on a single goal: to walk free, with no shackles, into a mountain life. Early morning. Wrapped in a duvet jacket, I sat in the prison gymnasium office, cradling a cup of coffee and listening to the muffled train-rattle of food trolleys being shunted along cold corridors, ra-ta-de-tat-ra-ta-de-tat, first loud, then not-so-loud – and then nothing. Thirty minutes left. It seemed I was always counting down. First class on Mondays, Wednesdays and Fridays was running. Over the years, prisoners in the running class had learnt to appreciate my early morning idiosyncrasies, and I had learnt to understand theirs. We ran three miles around an oval cinder track bordering the muddy football pitch. The track was surrounded by a tall fence, and beyond that the prison’s wall. Thirteen laps run with the strategy and cunning of an espionage plot. The speed would increase with every lap while we pretended not to be concerned, while we pretended to look at the ground and not to have noticed the opposition. I kept an eye on Mike, slightly chubby when first sentenced, lean and fit now. Mike pushed the pace along. Gary pushed also, but only for himself. He was not concerned in the slightest about where in the field he finished. Barry was the competition. Barry loved racing. And so did I. Lap thirteen. We had reached a lung-bursting crescendo of effort. The last lap was always a sprint that tore our lungs to shreds. But no matter what the end result, we all returned to the prison laughing and joking. Me and my training crew. We would have been called friends if the situation were different. The second class of the day was circuit training; time for more machismofuelled competition, more brutality in the guise of getting fit. Heavy house music shook the walls, echoing off the cavernous roof of the sports hall. My life was strip lights and plastic floors, and me and twenty or so inmates beasting ourselves into a frenzy of competition. Star jumps, press-ups, burpees, squat jumps, shuttle runs, sideways ski jumps over benches, sprinted laps of the hall and double bench step-ups. We were nearly fighting each other to get past to the next discipline. Even Gary was more competitive. Sweat sprayed the floor, and our eyes darted from side to side as we worked, to check no one cheated. Our pounding feet became sticky, the air thick with hot body odour. My third class was in ‘Four Shop’, an industrial workshop stripped down and converted into a weights room. It was a filthy, narrow room with a corrugated asbestos roof, illuminated by more fluorescent tubes. There were no windows. Metal electrical ducting and heating pipes ran like veins across painted brick walls lined with fading crumpled posters of men and women with ripped bodies, with scribbled arrows pointing out their massive muscles. The weight-training equipment was old school, as though I’d never left the Cheadle Health and Strength Club. There were racks of matt-black dumbbells, plates of iron disks stacked like pyramids, bars, cables, slides and springs, skipping ropes hanging from nails, benches made from angleiron topped with blue PVC, brown leather medicine balls, scuffed and worn, a canvas punch-bag, well patched and re-stitched, hanging from a chain. The room had a sound; it was the sound of human bodies making metal creak. 8 Responses to Echoes. The Book. The Reviews. love it. want the book. Hi Nick,Have just received my copy of your book via the guys @ V12. Good effort mate,i’m sure it’ll be well worth the waite! Just finished your book – great work! Not at all what I was expecting, or rather, it was, plus quite a few unexpected layers. The High Adventure is there alright, but the self reflection is unusually deep, and makes especially good reading. Looking at a three meter tall image of Jirishanca’s huge East Face takes on new meaning – spectacular stuff! Hope you make it back down to Peru again. Our whole family immensely enjoyed your book, ‘Echoes’; it was brilliant (unputdownable), inspiring and masterfully written. My only complaint: it was finished too soon. Although on the positive side it meant i didn’t have so long to wait for my turn. My only other concern is the effect it has had on my men folk. My husband, Chris, said your book made him feel soft and has given up any hope of ever making the grade ~ his ageing body may not cope with the training regime and my 24 year old son has adopted you as a role model. We read it whilst basking on a Greek nudist beach, when it got too hot to climb, on our recent trip to Kalymnos. Please write some more because we are looking forward to what comes next. I was recommended your book by Chris and Jane, Chris was half way through it and was obviously loving it so I went straight out (well, in on the computer) and bought a copy. Chris was right and I absolutely loved it. Being virtually the same age and leaving school the year after you to work with a game keeper too I could relate to a lot of your book, I only wish I had found climbing as early in my life as you did. But with books like yours I really can taste the adventure! Thanks Lee, your very generous message has made my day! Picked your book up late last year… a well written guide on how to escape the 9-5 and proof that it can be done. Loved it and have recommended it to everyone I know.